Krautkramer NDTimes Vol.2 No.2 Spring & Summer 98. Ultrasound inspection as a quality tool has become quite popular and effective in thickness measurement, flaw detection, and material characterization. Most systems utilize transducers which generate longitudinal or shear waves. These systems are very effective at detecting anomalies along the sound path. However, the sound path traverses only a small portion of the volume of the part, so the transducer is mechanically scanned to interrogate the entire volume. This is time consuming and, if done improperly, can miss areas. However, in those situations involving inspection of sheet or tubular materials, an alternate inspection method utilizing Guided Waves may be more suitable. Guided Waves are waves whose propagation characteristics depend on structural boundaries such as those in plates, tubes, rods, and embedded layers. These waves are usually generated by impinging the plate obliquely with a tone-burst from a relatively large transducer as shown in the figure below. The resulting refraction and reflection at the interfaces produces many new signal packets. If the angle of incidence, or the frequency of sound is adjusted properly, the reflected and refracted energy within the plate will constructively interfere, thereby launching the plate wave. Because these waves penetrate the entire thickness of the plate and propagate parallel to the surface, a large portion of the material can be interrogated from a single transducer location. The most common modes of guided waves for a free plate - symmetric and antisymmetric-are shown below. However, as the complexity of the particular situation increases, such as a layer between two different other materials, the complexity of the particle motion in the mode also increases. Unlike longitudinal or shear waves, many Guided Wave modes can exist in a particular component. Each of these modes has a particular wave structure. Wave structure describes the distribution of particle motion through the thickness of the layer. Some modes have large particle motion amplitudes near the surface while others have more intense motion near the middle of the layer. These motions are combinations of displacements perpendicular and also parallel to the surface of the layer. When multiple layers exist, the wave structure can become more complex. The wave structure determines the sensitivity of the particular mode to a particular flaw type. Different modes have different regions of sensitivity through the thickness of the material. Selection of the appropriate mode is very important to inspection optimization. It may be possible to perform an inspection using only a single mode. Therefore, the use of narrowband transducers to limit the number of generated modes is appropriate. If more information is required in the reflector classification process, then a multimode test may be more desirable. Multimode guided wave testing requires broad bandwidth transducers but yields additional information in more difficult test situations. 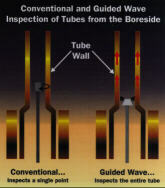 Following are several applications being developed for Guided Wave Inspection. Piping systems are often inspected ultrasonically to ensure safety. This can be accomplished by a series of point tests but from the outside of the pipe. If insulation covers the pipe, as is often the case, access to the outside surface requires removal of the insulation to perform the test, and then re-installation when testing is complete. 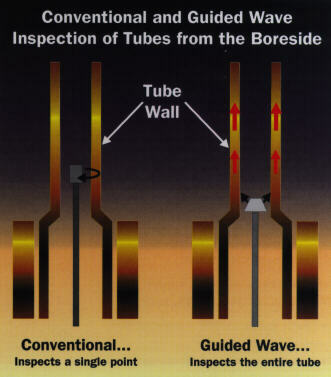 Using Guided Waves, a probe can be applied to the pipe at a single location and several meters of the pipe can be inspected. The insulation is only removed where the probe is applied. 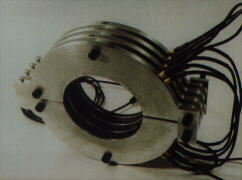 The probe shown below is a "comb" array design that completely surrounds the pipe. Tuning the element spacing and the excitation frequency permits selection of the appropriate Guided Wave Mode for inspection of the particular pipe geometry. Internal inspection of tubing has been traditionally accomplished using a rotating transducer to scan the tube wall point by point. Using a Guided Wave bore probe, as shown here, a wave can be launched that will propagate several meters along the tube yielding echoes at crack locations. It is even possible to segment the receiver element so that the circumferential location of the reflector can be determined. Adhesively bonded lap joints are often used in high performance structures such as aircraft bodies. Periodic inspection of these joints can be time consuming. The graphic below shows the inspection of a sample lap splice joint. Other configurations of adhesively bonded joints are possible. Using a fixture, ultrasonic energy is generated on one side of the joint, transmitted through the adhesive bondline, and received on the other side of the joint. The amplitude of the transmitted signal is a measure of the bond quality. Tuning is necessary, however, in order to find the best transmission mode across the joint. Tuning incident angle and frequency allows inspection of bonded joints having various thicknesses, structural configurations, and even joints having more than two layers. These are just a few of the applications in which Guided Wave inspection may improve test times and performance. If you have a test situation involving sheets, plates, tubes, pipes, or layered materials... call: Dane Hackenberger at Krautkramer Branson (71 7-242-0327) or Dr. Joseph L. Rose at The Pennsylvania State University (814-863-8026) for additional information. The here provided information is part of Krautkramer's NDTimes Vol2. No.2.